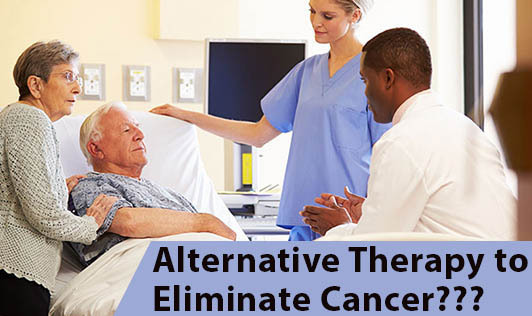 Alternative Therapy to Eliminate Cancer??? For ages, chemotherapy was the only known treatment to eliminate cancer cells. But new research suggests an alternative therapy for the same: Lifestyle modifications! However, extensive studies are required to arrive at the effectiveness of this treatment. • Cancer cells feed on both sugar and salt. Look for alternatives like molasses or honey or sea salt. • Starve cancer cells by cutting off milk as they produce mucus in the gastrointestinal tract and cancer cells feed on mucus. Unsweetened soy milk can be a healthier alterative for people with cancer. • Cancer cells thrive in an acidic environment. Avoid red meats as they create an acidic environment in the stomach and also contain parasites and growth hormones that are harmful to people with cancer. Meat proteins also stay in the stomach for longer time as it is difficult to get digested and if remained in the stomach can build up toxin! • Fresh fruits, vegetables, nuts, whole grains, seeds and beans (cooked) provide enzymes that enhance the growth of healthy cells in the body turning them alkaline. • Avoid coffee, tea and chocolates. They are high in caffeine and also increase the acidity of the body. • Avoid distilled water. Choose purified or filtered water. • Improve the oxygen levels at the cellular level by exercising regularly. Cancer is a disease of the mind and spirit. A stress-free, positive attitude will make you feel better from inside. Discuss with the Oncologist about the above modifications and understand what is best for the person with cancer.